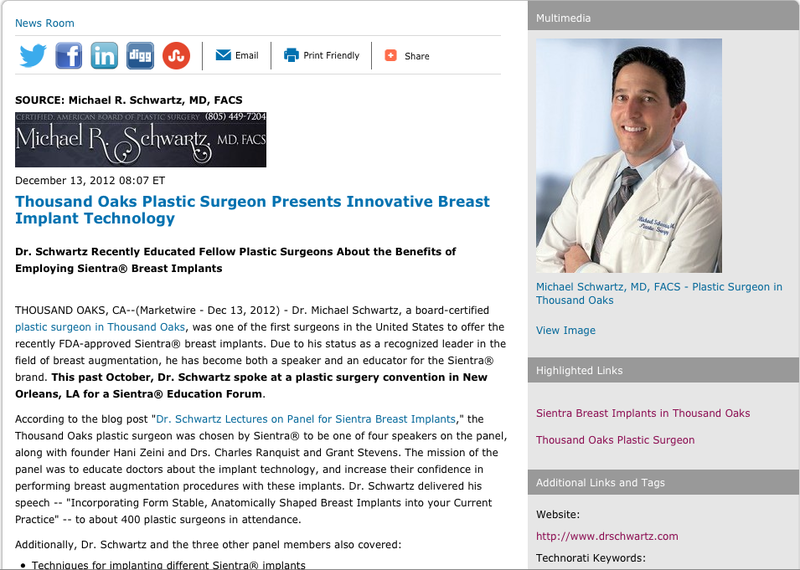 Thousand Oaks, CA – Dr. Michael Schwartz, a board-certified plastic surgeon in Thousand Oaks, was one of the first surgeons in the United States to offer the recently FDA-approved Sientra® breast implants. Due to his status as a recognized leader in the field of breast augmentation, he has become both a speaker and an educator for the Sientra® brand. This past October, Dr. Schwartz spoke at a plastic surgery convention in New Orleans, LA for a Sientra® Education Forum. According to the blog post “Dr. Schwartz Lectures on Panel for Sientra Breast Implants,” the Thousand Oaks plastic surgeon was chosen by Sientra® to be one of four speakers on the panel, along with founder Hani Zeini and Drs. Charles Ranquist and Grant Stevens. The mission of the panel was to educate doctors about the implant technology, and increase their confidence in performing breast augmentation procedures with these implants. Dr. Schwartz delivered his speech – “Incorporating Form Stable, Anatomically Shaped Breast Implants into your Current Practice” – to about 400 plastic surgeons in attendance. In order to establish himself as a leader in the latest implant technology, Dr. Schwartz went to Sweden three years ago to learn techniques for form-stable shaped implants designed by Sientra®. Since that time, he has sought to educate other practitioners in the field about the advantages of the unique implants. These breast implants are made of a high-strength cohesive gel that looks and feels more like natural breast tissue. Sientra breast implants are also leak-resistant, and, according to a recent Swedish study, decrease probability of capsular contracture as well as a rippling. Another distinct advantage of Sientra® implants is that they are available only to board-certified plastic surgeons. Because of this controlled distribution, Dr. Schwartz says patients receiving Sientra® implants can feel confident their surgery is being performed by the most highly trained surgeons in the field. Dr. Schwartz’s goal as a plastic surgeon is not only to educate his Thousand Oaks plastic surgery patients, but also his fellow plastic surgeons. He says he will continuously strive to remain at the forefront of his field so as to do his part in helping to improve the level of cosmetic care provided throughout the country. Dr. Schwartz is available for interview upon request.